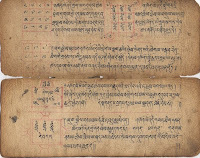 As a beautiful surprise last year, Barry bought this Tibetan manuscript book. 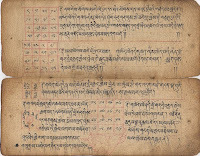 As we understand it, it is probably 17th-18th century but beyond that we don't understand its context or importance. 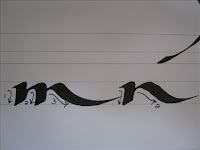 In a roundabout, somewhat connected way, I have recently been investigating abstract calligraphic art - and am working through why it appeals to me so much and why I like it. 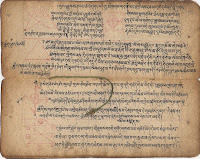 One of the things I have realised is that I love to see calligraphy written in other languages. As I consider why, I think it is in part because my left brain disengages - I look at the texture of the text, the rhythm, the movement, the lines and the shapes, without having my left brain try to "read" the writing and interpret it. I look at the visual cues not the verbal ones. This gives me a gentle sense of peace. And so when I see abstract calligraphic art written in English it does the same for me - I appreciate the beauty of the work before trying to interpret, read, or decipher the text. 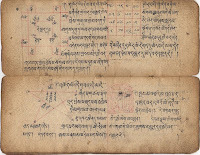 These are a few of the pages of the Tibetan manuscript (click on the image for a larger shot). I read a post on cyberscribes recently that really inspired me to pickup coloured pencils again. Donna Livingstone did this beautiful, simple, elegant piece using coloured pencils and I was reminded of how much I enjoy these oft-neglected tools. 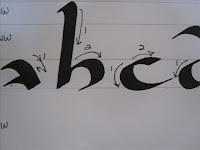 I had a window of about 20 minutes yesterday after cleaning the studio and before preparing dinner, arranging visits with my niece and her grandmother and heading out to a picnic, so I grabbed my pencils and a scrap of Canson Mi teintes and just wrote two practice "peaces". I like the idea of peace coming out of the negative space - of kind of always being there but needing help to emerge or be seen. I just drew some weird letter shapes and waited to see what would emerge. I then got colourful and free and felt wonderful as I played with the bright swirliness of this peace. I hope to do some proper pieces to send to Mike very soon. Clearly I need this project. 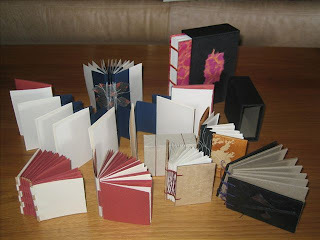 No other creativity has occurred through the week - unless you count reading some lovely books Noela loaned us; or receiving two new journals (Letter Arts Review and Bound and Lettered). 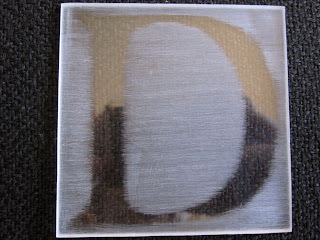 So despite feeling a bit wrecked/exhausted I headed down to the studio yesterday to tackle my "D". 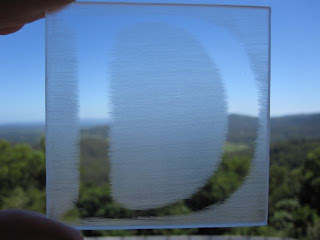 I have engraved into perspex before but haven't really used sandpaper to create an image; so I drew the letter onto contact, cut it out, and stuck it on the perspex. I then used a fine sand paper to sand the front of the piece - taking care not to lift the edges of the contact. I tried a few things to get closer to the edge of the contact in order to make the letter the same size as I cut, but regardless of what I tried, there was a fair bit of room between where the sanding finished and where the letter started. I pondered if I should cut the letter out of the contact and sand the shape of the letter instead; or should I draw the letter backwards and stick it on the back so the top surface is smooth...all those design decisions. In the end I liked that it has the textured surface on top and that the letter is kind of the negative space. 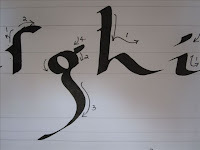 To see what others are up to - got to the new blog A Letter A Week 2010 and enjoy the fun. I have been a bit off this week and not in the studio at all until today - so this little project is doing what I hoped it would - making me go down and DO something even when I'm not full of creativity. 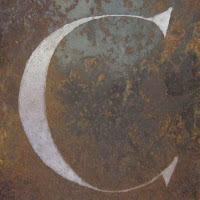 Here is my experimental "C". 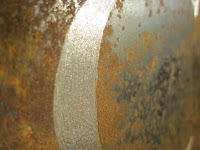 It is a piece of rusted steel which I then used a dremel to engrave into the metal, revealing the shiny steel under the weathered rust. I wrote the letter out first, traced it and then transferred it to the metal using some very cool hard soap pencils that a Japanese friend had sent to Barry. They draw on metal really well. Despite some hassles compressing these photos for the web - here are some shots and some detail, with different light effects. Words For Peace. 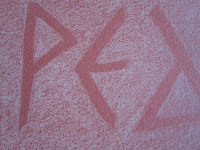 That’s the theme: PEACE - in all of its forms and manifestations. Peace on earth, Peace to mankind. Peace between peoples, between countries, races, and religions. Peace of the Spirit. Peace of God. Give Peace a Chance. Peace of Mind … take it where you will. So think Peace. He is accepting pieces 5 inches x 20 inch between now and Easter - so think about joining this gathering of folk who care and want to make a small, beautiful, artistic, commitment to peace. I read a lovely sentiment on Cyberscribes recently (it was actually a quote and I have lost it) with regard to not being ashamed of your early work. It was about looking back kindly and gently on your beginnings and recognising them as reflecting who you were then. I think its good and wise to look back and see what I would do differently and to realise where I have improved - there is no shame in humble beginnings. 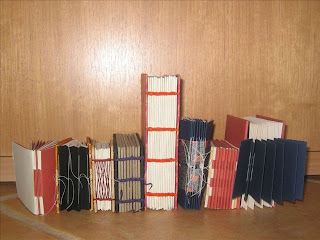 In this spirit, here are some photos of my first books - I am still quite fond of them. And...this is my first post from my new Mac! Yippee! 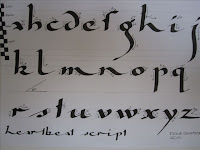 As my calligraphic life continues to grow, I have developed my own little script which works well for me. I call it my heartbeat script and I have used it quite a lot when writing poetry in handmade books, and it has a lovely rhythm when written. It's a kind of expressive cursive with a few quirky bits. Barry suggested I do an exemplar of it, (along with another weird script I developed, but I haven't yet done that) and so I sat down to try and work out the details of what I am doing when I usually just write it. It is only 2 nib widths high; the nib is at a fairly shallow 30 degree angle and the letters with ascenders reach either 4 1/2 nib widths or 6 nib widths high (I told you it had quirky), and those with descenders reach either 6 nib widths down or a long way down at 9 nib widths. That calls for a capital "Q" for Quirky I think. Here are a few shots of the exemplar so far. I realised as I wrote it that the script is not just about the letters; its' very much about the joins - where and when I join letters up as I write. 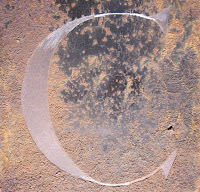 It has been an interesting week with people joining the challenge from all over - a real mix of calligraphers, ceramicists, metal workers, mixed media artists, photographers... so I think it will be fascinating to observe the evolution. 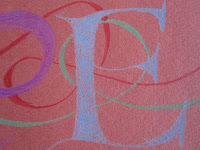 I am confident that I am doing one alphabet experimenting with different media. 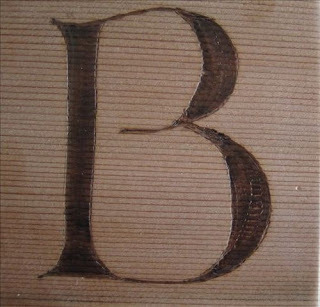 To try and keep a sense of unity however, I have chosen to do each letter as a Roman Capital - but to vary the materials and methods I use. Today I took to the timber with the 'hot poker' - a tool I have never picked up nor used before. It was fun learning how to move it; how much pressure to use; and to see the different effects I could achieve. Here is the resultant 'B'! I said a maximum of 6, they booked in 8 then 9 showed up so we were in the thick of it early! On top of that 4/9 of the children were left handed! Did I mention I have never taught a left handed person before either? LOL! 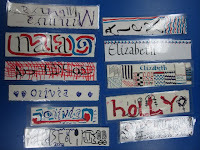 But we had fun - we practised with Pilot Parallel pens or markers for the lefties, making thick and thins, and patterns and then words and then wrote a name and decorated it on a book mark which we laminated. We had a mixed bag of ages 6-14 which added to the delightful and colourful mix. Here are some shots of the fun that was had. 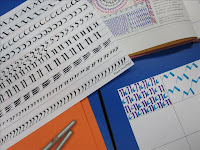 A couple of calligraphic friends (Gemma and Pam) and I have set ourselves a little challenge for the year - to write a letter a week, creating 52 letters, which must form 2 alphabets, by the end of 2010. We have few rules - any medium, any style - but the letters must be written on a 7cm x 7cm square. None of us thought we could commit to a letter a day; and 52 weeks equals 2 x alphabets so perfectly anyway! 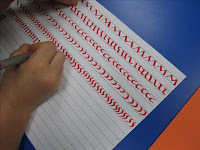 We can choose our own theme; we can choose what we do with them at the end; we can write any letter any week - as long as we end up with 2 alphabets. We aim to do a monthly sharing of our progress (method to be determined) and may even try to have a showing or mini-exhibition of the end results next year. I am definitely doing one experimental alphabet - forcing me to use different materials, experimenting with techniques and tools - and one other alphabet which I am still not sure what my theme will be. Hopefully inspiration will arrive. 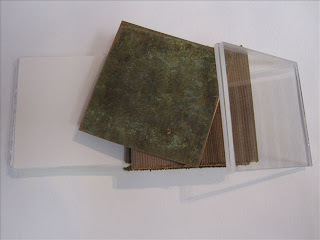 I spent some time today preparing and tearing paper, as well as cutting up some copper, some timber and some perspex. No idea if I will use any or all of it but I'm keen to try! Here is my little stash so far; as well as an experimental 'A'. 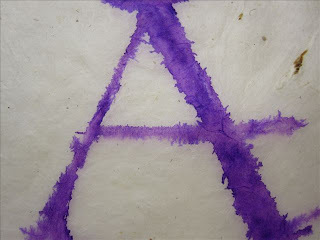 I wrote on really fine kozo paper with a purple marker; then went around it with a water pen/brush and liked the way it blurred. This letter may or may not remain; but the project has already encouraged me to play which is the whole idea. We are open to other people (calligraphers and non calligraphers) joining us - I think Barry already has a metal alphabet underway! Well it feels like a positive start to the new year as I have managed to not only tidy up the bathroom cupboards, but also my paper cupboard. We recently bought some shelving in the raw, and edged it yesterday by ironing on this stuff (technical term),and then Barry trimmed it all down today. 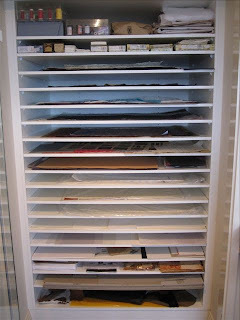 This encouraged me to get in and sort out the paper cupboard - am now wishing I did a before and after shot, but never mind. We had to take the doors off in order to get the new shelves in; but now I have eight more shelves than before! Now let's see just how long this tidy-look lasts!